It pays to get up early. Get to The Market when it opens to find the best selection and the freshest produce. The Market is open May - October. 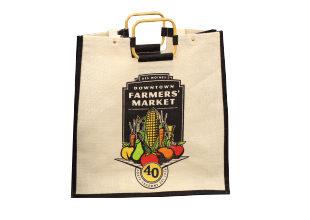 Some vendors have plastic bags, but it’s best to bring your own canvas shopping bag or basket from home. It’s much better than having all your items bagged separately. The Market sells the ever-popular jute shopping bags at the Information Booth, located at Third Street and Court Avenue. Storing a cooler in your car helps keep food items cool, especially if you don’t go home right away. Ask vendors questions when you see unfamiliar produce. Vendors and farmers love to share their knowledge and can even give you recipes and cooking tips. Wear walking shoes and dress appropriately for the weather. The Market is open rain or shine, so dress accordingly. Learn more about The Market's weather policy. Be kind to your pups and leave them at home, as the environment can be overwhelming for many dogs. If patrons do choose to bring their pets, they are expected to act in a responsible manner and adhere to these rules to make everyone’s Market experience pleasant. Dogs must be under control on a short leash (maximum three-foot leash), and by the owner’s side at all times. Dogs need to be kept away from produce, plants and prepared food products. Dogs need to be courteous and able to socialize with people and other dogs. Be understanding. Not everyone loves dogs, and some fear dogs. The Market operates under the City of Des Moines’ laws regarding pets, which include a leash law, cleanup of droppings, current tags and a current rabies certificate. Plan in advance to bring doggy cleanup bags or use bags provided around The Market located in dispensers on various light poles. These terms are related to farming practices, animal husbandry and food processing. Many of these terms do not have legal definitions and may mean different things to different people. By shopping at The Market, you can talk to the people who produce your food. Please ask vendors about their practices. The U.S. Department of Agriculture (USDA) is responsible for managing the National Organic Program, which was implemented in October 2002. Organic farming avoids the use of most artificial inputs, like synthetic pesticides and fertilizers, and bans the use of animal by-products, antibiotics and sewage sludge among other practices. Any food product (except fish) using the word organic must be certified as such by an official USDA accredited certifier. “Finished” animals have reached physical maturity and have developed fatty tissue. Some grass-fed animals, like most livestock in the U.S., are grain finished, or are fed grains for an underdetermined amount of time before slaughter. Other grass-fed animals are grass finished: they fed exclusively on grasses throughout their whole life. Unlike the few animal breeds that dominate the meat industry, heritage breeds are rare and have a long history. Modern breeds have been selected for qualities that make them ideal for industrial meat production. Similar to heirloom fruits and vegetables, heritage meats typically have unique characteristics and tastes that make them highly desirable. Because these breeds are often native to particular regions and climates and may not be suited to industrial facilities, such animals may be raised in a more sustainable manner, with access to open pasture and a diet free from antibiotics and growth hormones.